"Immigration detention is now a billion-dollar business. It's closely linked to the private prison industry, otherwise known as the 'corrections-industrial complex'." 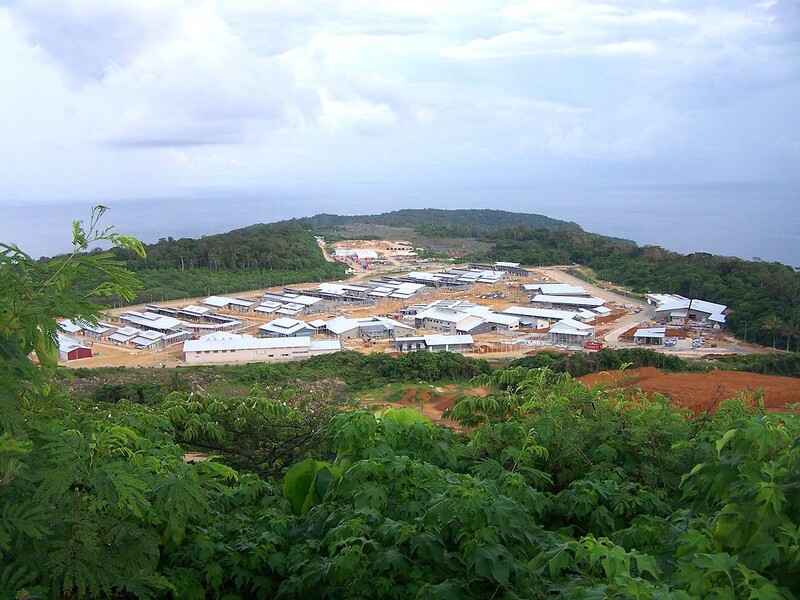 "In Australia, Europe and the United States, a small number of multinational corporations are competing for government contracts to lock up asylum seekers and illegal immigrants." "And some of the biggest banks and investment funds are lining up for a slice of the action." "This is a lucrative business, we're talking here about detaining men, women and children in prison-like conditions, as a business." "And so certainly from the perspective of companies that are engaged in this kind of work, they would be looking to you and saying, 'Well we can expand into this market'." This page is a transcript of the ABC Radio National broadcast of Sunday 20 June 2004, with Tom Morton, highlighting companies such as Global Solutions Limited which eventually grew out of the corrective detention industry that had started with the Corrections Corporation of America. Amongst the guests on the program are human rights and detention conditions campaigner Charandev Singh and the former HREOC Commissioner Sev Ozdovski. Tom Morton: Hi there, I'm Tom Morton, welcome to Background Briefing. And today, the latest global growth industry: immigration detention. Immigration detention is now a billion-dollar business. It's closely linked to the private prison industry, otherwise known as the 'corrections-industrial complex'. In Australia, Europe and the United States, a small number of multinational corporations are competing for government contracts to lock up asylum seekers and illegal immigrants. And some of the biggest banks and investment funds are lining up for a slice of the action. Liza Schuster: This is a lucrative business, we're talking here about detaining men, women and children in prison-like conditions, as a business. And so certainly from the perspective of companies that are engaged in this kind of work, they would be looking to you and saying, 'Well we can expand into this market'. Michael Welch: The detention apparatus in the United States pretty much has a blank cheque. It would be hard to imagine a better set-up between the Federal government and its willingness to do business with private companies, and this is a globalising trend. This is an opportunity for a lot of investors and a lot of private companies to seize, for the express purposes of generating revenue. So in that respect, these prisoners are actually raw materials for the private sector. Tom Morton: In the language of the private prison industry, prisoners are product. As the founder of one of the world's largest corrections corporations says about the prison business, 'You just sell it like you were selling cars, or real estate, or hamburgers'. And if prisoners are raw materials for the corrections-industrial complex, then the 840 people in Australia's mainland detention centres have just been sold. Global Solutions Limited, the British-based company which operates detention centres and prisons in Australia and the UK, was sold in late May by its parent company, Group 4 Falck, for around half-a-billion dollars. Global Solutions was snapped up by two European venture capital funds, who obviously believe the company has good prospects for growth. Television commercial: Start with a growing market; swim in a stream that becomes a river and ultimately an ocean; be a leader in that market, not a follower. Tom Morton: Those are the words that Englefield Capital used on their website to announce that they were buying Global Solutions Limited. And immigration detention certainly looks like a stream that's set to become a river. Corrections corporations, like GSL or Wackenhut, which used to run Australia's detention centres, argue that they're simply responding to a market need. In the US and Europe, governments are clamping down on immigrant workers without work permits or valid visas, and locking them up in detention centres so they can be sent home. Liza Schuster: The fact is that so long as there is a huge difference between the wealth of the European countries and the countries of origin of these people, they're going to want to come. There will be a never-ending supply. Therefore, if I was a detention, custodial services company, why not get into this market, it's not going to dry up. And there's nobody to watch what I do. Tom Morton: Liza Schuster, of the Centre on Migration, Policy and Society at Oxford University. The reality of what goes on inside detention centres is often hidden behind high walls of secrecy. Government contracts with the private operators are declared commercial-in-confidence. Even the public scrutiny that exists in prisons is lacking. In many ways, detention centres are a legal no-man's land, where detainees have fewer legal rights than convicted criminals. In Australia, the United States and Europe, a dark underside to this new market is emerging. It's a common pattern of allegations of assaults and other abuses against detainees. And a damning new report argues that our own government used its contract with ACM, the private company which used to run Australia's detention centres, to evade responsibility for serious human rights abuses. Richard Harding: I think that the government in a sense, was trying to purchase some kind of moral immunity for the fact that it was setting in train regimes that really could not, and would not, conform with international obligations. Of course, there is no way that any government can contract out of its international obligations and its duty of care. But the government wanted this to be out of sight and out of mind. Tom Morton: Richard Harding, the Inspector of Custodial Services in Western Australia. He was commenting on the Human Rights and Equal Opportunity Commission's recent report on Children in Immigration Detention. We'll hear more on that report from Richard Harding later, and on why he and others in today's program think there's a common thread linking abuses in detention centres with the human rights abuses in the Abu Ghraib prison in Iraq. In the United States, the corrections-industrial complex is backed by some of the most reputable banks, investment houses and pension funds. Michael Welch is Associate Professor of Criminal Justice at Rutgers University, and he's been investigating the corrections connection. Michael Welch: And what I found in my research and what I'm presenting in a paper in London towards the end of June, is connecting the dots between American businesses and their financial backing and corporate backing. And what we're finding is this is an incredibly elaborate corporate and financial arrangement. When we looked at, for instance, the top three corrections corporations of America, I'm just going to mention a few of the corporations that they're involved with, including First Union, South East Bank, Nashville's Massey-Birch Investment Group, Global Expertise in Outsourcing, which is formally known as Wackenhut, does business with Prudential Securities and a number of other financial backers, and Cornell Corrections has also a long list of corporate and financial backers, including ING Barings, and TIA Kreft which is the giant pension fund for university faculty and staff. So this is a well-established network that continues to grow and continues to take advantage of the phenomenon of incarceration and detention. Tom Morton: So in other words, these are mainstream investors, banks, investment funds and so on, who are investing now in these big three private corrections corporations which have also moved into the immigration detention market? Michael Welch: That's true. That's one of the areas that these companies are moving into as immigration, because it's on the one hand a growing detention population, and in the US the immigration authorities have very limited numbers of facilities that they actually operate. Tom Morton: Since the very beginning, the private prison business and the immigration detention business, have been intertwined. Tom Morton: The corrections-industrial complex got its start in 1980 in Nashville, Tennessee, at a campaign fundraiser for Presidential hopeful, Ronald Reagan. Over cocktails, the Chairman of the Tennessee Republican Party and the Corrections Commissioner of Virginia, came up with an audacious idea: starting a private company to run prisons. They got the Tennessee Commissioner of Corrections on-side, and set up what became CCA, the Corrections Corporation of America. Three years later, they scored their first contract, with the Immigration and Naturalization Service. Here's a reading of how Tom Beasley, one of those co-founders of CCA, described those heady days in a recent interview on the company's website. Don Hutto and I sent down to Houston on New Year's Eve in 1983. We rented a car at the airport and drove around the major thoroughfares to find somewhere to put 200 illegal criminal aliens by February 1st. Literally, we stopped in ten motels, then finally about 3am found one that might work. I asked if they would be interested in selling or leasing the motel. And after negotiating with the owner for several hours, he finally agreed. Tom Morton: Corrections Corporation of America, better known as CCA, went on to become a multi-million dollar concern operating prisons and other correctional facilities in 20 States. But the immigration detention business remained only a small part of the market for the private prison companies until the late '90s. The private corrections industry boomed. Companies like CCA built prisons on spec, without any contracts, and then lobbied State governments to supply them with prisoners. In the golden age of outsourcing, State governments enthusiastically obliged, and investors flocked to buy shares. But after a decade of growth, things started to go wrong. Judith Greene is a criminal justice policy analyst with Justice Strategies, based in New York. Judith Greene: By the late 1990s, CCA had over-built and they went into financial decline. A combination of operational problems, the most famous of which and most well-known in this country, was a series of violent incidents in a prison they'd built on speculation in Youngstown, Ohio, and they secured a Federal contract to house prisoners from the District of Columbia. Once the prison was opened, and these prisoners were bussed in, the prison became very violent, and over the space of about a year's time, there were more than 20 stabbings and two deaths. When six prisoners escaped from their prison in 1998, the prison became a national story, a front-page story, of this private prison that had gotten completely out of control, and then over the next year or two, there were a series of highly publicised problems in private prisons and jails around the country. So suddenly, government officials became wary of using private prisons and certainly became wary of sending anything other than the lowest level best-behaved prisoners. Tom Morton: By the late '90s, Corrections Corporation of America had 10,000 empty prison beds and no contracts to fill them. CCA was facing bankruptcy, and things were looking bad across the whole private prison industry. But just as the supply of prisoners began to dry up, a whole new source of immigration detainees was coming on-stream. And it had its origins back in 1994. Judith Greene: In 1994, the same year that NFTA was enacted, the North American Free Trade Alliance, which opened the border significantly to commerce but not to migration populations, the US government threw up sensors on the south-west border; we have a large fence at San Diego and another one at El Paso, and flooded the whole border with immigration agents working in concert with the US Army and the Federal Drug Enforcement Agency. So the result was the beginning of a balloon in our immigrant detention population. Tom Morton: In 1996, with the support of both Democrats and Republicans, Congress passed a swathe of legislation, giving the immigration authorities, the INS, much greater powers to detain asylum seekers and illegal immigrants. The new laws also targeted legal migrants who'd been convicted of minor criminal offences, including some small drug offences, allowing them to be detained and deported. That package of laws created a whole new market in the making. Michael Welch: Well it changed things overnight, and in 1996 the INS became the largest law enforcement agency in the United States. And along with that new authority was increased reliance on detention. There was the explicit statement that detaining illegal immigrants is an effective way to deter people from coming into the United States unlawfully. So it was used as a form of deterrence. Of course that didn't work, and one of the problems it creates for the INS is, they don't have enough space for the volume of detainees, so then it relies on the private sector to alleviate the crowded jails. So of course we saw the private corrections firms moving quickly to compete for the INS contracts. Tom Morton: If the new immigration laws had helped to bail the prison industry out of their serious financial problems, it was al-Qa'eda who showed them blue skies up ahead. In 2002, the CEO of Cornell Companies, Steve Logan, told investors in a conference call that September 11th would mean a big boost in the market for immigration detention. Here's a reading of what he said. I think it's clear that since September 11 there's a heightened focus on detention. More people are going to get caught. So I would say that's positive. The other thing that you're seeing, and to be honest with you I have no idea how this is going to impact us, but it's not bad, it can only be good, is the focus on people that are illegal and also from Middle Eastern descent in the United States. There are over 900,000 undocumented individuals from Middle Eastern descent. That's, keep in mind, that's half of our entire prison population; that's a huge number, and that is a population, for lots of reasons, that is being targeted. So I would say the events of 9/11, let me back up: the Federal business is the best business for us. It's the most consistent business for us and the events of September 11 is increasing that level of business. Tom Morton: Since making that prediction, Steve Logan has left Cornell Companies for another job. And the further boom in the supply of immigration detainees which he prophesied after September 11th, hasn't eventuated. But according to Michael Welch, Steve Logan's speech shows just how the private correctional companies speculate on events like September 11th, when they go to raise money from the markets. Michael Welch: The point is that he looks at this as a financial opportunity. So on the one hand we have to be concerned about national security, on the other hand it's important that we sociologically understand that there's an industry that's going to respond to that emergency, and will certainly exploit it if it's in their best interest. This factors into my reference to the field of dreams, which is that if you build them, they will come, and that refers to an American movie about baseball, in which a baseball fan wants to visit his heroes of the past, and one way to get them to come to his town is to build a ballpark, and that's The Field of Dreams, it's the same phenomenon that's taking place in prisons. These are correctional companies that simply influence financial backers and corporate sponsors with pure speculation that there's going to be an increased volume of detainees, and the detention apparatus in the United States pretty much has a blank cheque. Tom Morton: In Europe, there are also signs that immigration detention is becoming a growth market. Until a few years ago in the EU, only a relatively small number of people were detained for immigration reasons. Asylum seekers were generally allowed to live in the community while their claims were being processed. But according to Liza Schuster, of the Centre on Migration, Policy and Society at Oxford University, the last few years have seen a dramatic shift. Liza Schuster: People are detained on arrival, and increasingly we're seeing people being detained while their claim is being processed all the way through, and it's in order to facilitate the processing of the claim, allegedly. In fact it's very hard to avoid the impression that detention is being used as a punishment, which of course it shouldn't be, because these people, and I stress it, have not committed a crime. They've breached immigration law, that's completely different. So across Europe we've seen this shift more towards the Australian system. Tom Morton: Liza Schuster says the new emphasis on detaining asylum seekers and illegal immigrants in Europe is opening up business opportunities for the private sector. Start with a growing market, swim in a stream that becomes a river and ultimately an ocean, be a leader in that market, not a follower. Tom Morton: And one of the companies that may be eyeing that new market in Europe is Global Solutions Limited, which currently has the contract to run immigration detention centres here in Australia. Global Solutions also runs detention centres and prisons in the UK. Until very recently, Global Solutions was a subsidiary of Group 4 Falck, one of the largest security companies in the world. But a few weeks ago, Group 4 sold Global Solutions for around half-a-billion dollars. The new owners are Englefield Capital and Electra Group, two European venture capital funds with deep pockets and impeccable connections. Englefield's advisory board boasts the Secretary-General of NATO, Lord Robertson, and Sir David Frost. And they're backed financially by a publicity-shy, but extremely wealthy family of Dutch financiers, the Brenninkmeiers. There was some vigorous jostling amongst investors to buy Global Solutions. The American corrections multinational GEO, formerly Wackenhut, was an early contender, but then dropped out of the bidding. And according to market analyst Philip Borel, the new owners will be looking to build up the value of the company and then sell it four or five years down the track. Philip Borel: There are several techniques that are part of this process. One is to bring in management expertise to grow a company within its sector; another technique that is very common nowadays is to buy a business as an initial platform, and then make so-called add-on acquisitions to the business, i.e. buy competitors and help the business lead the consolidation in its sector. Yet another very popular technique is to look at the markets in geographic terms, in which a business may be operating today and try and help it identify other markets elsewhere in the world, to expand into, and then make additional capital available to these companies to fund such geographic expansion. Tom Morton: Philip Borel, from the website Private Equity Online. Background Briefing approached all three companies: Global Solutions, Englefield and Electra, to talk about their plans for the future, but none are commenting at present because the sale won't be concluded until early July. Global Solutions' new owners are plainly undeterred by past controversy. Two months ago, Gareth Myatt, a 15-year-old boy, died in a juvenile detention centre run by GSL after being physically restrained by three guards. Gareth, of Afro-Caribbean background, was five-foot tall and was only four days into a one-year sentence. His death is now the subject of a police investigation. In February 2002, Yarl's Wood, an immigration detention centre in London operated by Global Solutions, burnt down after a riot broke out. There have been no fewer than three independent inquiries into the Yarl's Wood fire. The most extensive inquiry, conducted by the UK Prisons Ombudsman, still hasn't reported more than two years afterwards. Charandev Singh is a human rights advocacy worker with the Brimbank Community Legal Centre, and he's been following the story of Yarl's Wood since the fire happened. Charandev Singh: Yarl's Wood was a fairly new detention centre built as the largest detention and removal centre in Europe, and what was alleged to have happened in this, there was a pattern, a culture of abuse operating at that centre, that culminated in detainees witnessing the abuse of an elderly African woman on the night of February 14th, which gave rise to a major disturbance, where some detainees said that they were locked into the building during a major fire. And in the end, detainees had to break out of the building to escape the fire. The detention centre was very, very badly damaged, the destruction was so great that the local police began a corporate manslaughter investigation because they were unsure whether detainees had actually been burnt to death, and it was only after the extensive use of forensic archaeologists, and scientists were able to verify that in fact no-one had been burnt to death. Tom Morton: Background Briefing contacted Global Solutions Limited for a comment in relation to the Yarl's Wood fire. A GSL spokesman said that the company has co-operated fully with the Ombudsman's inquiry, and doesn't want to undermine the inquiry by commenting prior to publication. Last December, the British Daily Mirror published a story alleging a systemic culture of racism and abuse of detainees at Yarl's Wood. The UK Prisons Ombudsman mounted a new inquiry into the allegations raised by the Daily Mirror. The Ombudsman found that there was a disproportionately large number of incidents of use of force at the centre. But the Prison Ombudsman found that there wasn't a systemic culture of abuse, racism and violence at Yarl's Wood, and that finding is hotly disputed by refugee advocacy groups in the United Kingdom. Allegations of assault and other human rights abuses are not confined to immigration detention centres run by private companies. Recently Medecins sans Frontieres published a scathing report on a centre in Italy, run by the Red Cross. Liza Schuster: In the Medecins sans Frontieres report it was noted that the Red Cross people in some of the detention centres wore uniforms and behaved like security guards, rather than people charged with looking after the welfare of the detainees. And I have to say it's not wholly surprising, if you put a group of people in uniform, put them in charge of a vulnerable group of people who don't have access to the kinds of protections that you and I might have, it's very easy to slide into very bad ways of treating people, including, on occasion, violence. And there's an incident that was recounted by the head of the Italian mission, one of the Medicines sans Frontieres team. He was actually present when this Red Cross (I shouldn't call him a guard, but I don't know what else to refer to him as) guard, grabbed the arm of a detainee who had been slashing it, I think it was with a broken piece of glass or a tin, and just poured neat alcohol over his arm, which as you could imagine caused huge amounts of pain, and told him to just go away and stop bothering him. Tom Morton: Medicines sans Frontieres have now been banned from entering detention centres in Italy, by the Italian government. In the continental European countries, there are legal limits on the length of detention. They range from 30 days in France to six months in Germany. But in the United Kingdom, as in Australia, people in immigration detention can be detained indefinitely, despite the fact that they haven't been charged with any crime. The Australian government successfully argued in the High Court last year that it has the power to detain people for the rest of their lives if they can't be returned to their country of origin. Liza Schuster argues that it's the fundamental nature of detention itself which leads to human rights abuses. And in Schuster's view, the walls of secrecy surrounding detention centres help to breed a systemic culture of abuse, regardless of whether they're operated by private companies or by NGOs like the Red Cross. Liza Schuster: It's hard to see this is anything other than systematic, and by that I mean that this kind of abuse is engendered by the system. Unfortunately the system is such that it becomes very easy for people to behave in this way, and I would suggest people are encouraged to behave in this way, and when furthermore, it is drummed into them that these people don't have a right to be here, that they should go home, that they are a drain on our resources, that they are potential if not actual criminals. It's very difficult to see how people placed in a position of authority over these people that they are taught to despise, are not going to abuse them. Not unless there is very good training and very careful scrutiny, and I don't believe that there is a single country anywhere in the world where that kind of careful training and careful scrutiny takes place. Tom Morton: Lack of proper scrutiny is also a central issue in the recent report on children in Australia's immigration detention centres, published by the Human Rights and Equal Opportunity Commission, or HREOC. Titled 'A Last Resort?' the report is over 900 pages long, and took more than two years to produce. It's by far the most comprehensive study of privately-operated immigration detention centres anywhere in the world. Many of the issues canvassed in the report have already been covered extensively in the media. But what's new is the Commission's forensic examination of the relationship between the Department of Immigration, or DIMIA, and ACM. The report reveals an often dysfunctional relationship, with both parties trying to shift the blame to the other when things went wrong. Richard Harding: The report has the effect of establishing that DIMIA is leading the dance and ACM is the partner that's being led. It actually makes DIMIA look worse and ACM much more a kind of passive player in this danse macabre. Tom Morton: So when you say that it makes ACM much more like a passive player are you saying there that they were allowed to be passive because DIMIA in a sense, was not very interested in what was happening in the detention centres, not very interested in monitoring what was going on there? Richard Harding: Absolutely. I think it's important to emphasise that the government contracted a price which really was a bonanza price for the operators. I think that the government, in a sense, was trying to purchase some kind of moral immunity for the fact that it was setting in train regimes that really could not and would not conform with international obligations. Of course, as the HREOC report cogently sets out, there is no way that any government can contract out of its international obligations and its duty of care. Tom Morton: Over the period that ACM had the contract to run the detention centres, the company was paid $600-million by the Commonwealth government. The HREOC report says that during that time the government allowed repeated breaches of the International Convention on the Rights of the Child to occur in the detention centres. The report's strongest finding is that the Commonwealth allowed cruel, inhuman and degrading treatment of children in detention. Here's the Human Rights Commissioner, Dr Sev Ozdowski, to explain why he made this finding. Sev Ozdowski: We looked at very specific set of circumstances. We looked at the circumstances where children exhibited severe symptoms of mental illness, where mental health professionals from State agencies or some other mental health therapists repeatedly recommended to the Department of Immigration that children should be released from detention with their parents as a matter of urgency because simply their health cannot improve in detention environment, and when the Department of Immigration refused to act on recommendation of mental health professionals, so only in these circumstances we found that there was a cruel inhuman and degrading treatment. Tom Morton: Dr Ozdowski gave an example of a case which he believed typified his finding of cruel, inhuman and degrading treatment. Sev Ozdowski: I remember very well one family which spent in detention by now over three years, and after first year, and I met them a number of times when I visited different detention centres, after one year, father lost mental health. He basically went into deep depression and it was documented from year I think 2002, then the son, who was at that stage 11 years old, attempted to commit suicide on numerous occasions, he was also self-harming himself, and there was consistent string of medical advice that they got to be released because simply the environment of the detention, it's only aggravating the situation. And finally, mother went down, if I could say so, and she succumbed to mental illness. So we had a number of families in these tragic circumstances, and the Department of Immigration was receiving advice for more than two years, and they did nothing about the health of these people, despite they had opportunities to let them go. Tom Morton: Background Briefing invited the Minister for Immigration, Amanda Vanstone, to respond to the findings of the HREOC report, but she was unavailable. The 11-year-old boy whom Dr Ozdowski mentioned, has recently been recognised as a refugee, along with his family, and released from detention. In fact6 92% of children held in detention between July 1999 and June 2003 were found to be refugees. Dr Ozdowski points out that the Commission's finding of cruel, inhuman and degrading treatment is a limited one. It doesn't apply to all children in detention, only those who had serious mental health problems, and who the health authorities were recommending should be removed from detention. And the Commissioner also says that he found no evidence of systemic physical mistreatment of children. However the inquiry did receive evidence of assaults within the detention centres. Sev Ozdowski: Allow me to say that because of procedural fairness I excluded quite much of evidence from the report. For example, we've got quite much of evidence in camera about assaults; we didn't use that evidence and that evidence is not reported in the report, mainly because I couldn't reveal that evidence to ACM and DIMIA because it was provided in camera. Tom Morton: This is by former ACM staff or by detainees? Sev Ozdowski: Let's put it by witnesses and witnesses came also from former ACM staff, from former and current DIMIA officials, from a whole range of other people who worked in detention centres. So it was first-hand evidence. Tom Morton: Just in relation to something you said a moment ago: you said that you had evidence given to you in camera, concerning assaults. Now those were assaults on detainees? Sev Ozdowski: Well I don't like to go into detail but there was a whole range of evidence which we couldn't corroborate to other evidence and consequently we didn't use it because we knew what serious legal implication would mean if we had used that evidence. Tom Morton: What do you mean by serious legal implications? Sev Ozdowski: Well if you report that assault took place, possibly the prosecution could have followed, and we thought it's not proper to put only one side of the story when you can't test the other side of the story. Tom Morton: But why couldn't the other side of the story be tested? Why couldn't those allegations be put to ACM of the Department? Sev Ozdowski: Because then we would need to reveal the names of our witnesses, and sometimes witnesses who gave evidence in camera were simply afraid of the consequences of them talking to us. Tom Morton: Background Briefing invited ACM to respond in an interview to the findings of the HREOC inquiry, but they declined. ACM requested that we quote from a press release that they issued after the report was released. Here's a reading from that press release. The Inquiry's major findings and recommendations concern the legal and policy setting for the administration of immigrations detention. In ACM'S view, these are matters for response by the government, the Department of Immigration and not ACM. ACM does not necessarily agree with all the observations and findings of the Inquiry. There are areas within the report that we believe are based on untested and unreliable individual anecdotes. Tom Morton: The HREOC also finds that the government 'failed to protect children in detention from physical and mental violence'. Tear gas and water canon were both used on children during riots at detention centres on a number of occasions, with authorisation from the Department of Immigration. Evidence given to the Inquiry also reveals that some ACM staff tried to stop this happening, but they were overruled by their own management. A former ACM Operations Manager at Woomera, Allan Clifton, told the Inquiry that he'd personally interceded with ACM head office to try to prevent a riot at Woomera. Detainees at the centre were protesting because a number of their fellows had been put into isolation detention. Clifton negotiated with the protestors, and here's a reading of his evidence. I warned that there would be a riot if nothing was done, and I did not believe that we had enough staffing resources to handle the situation, but I was ignored. After I communicated the decision to the detainees, there was a riot with fires and extensive property damage. Tom Morton: Richard Harding says that Alan Clifton's evidence reveals a lack of scrutiny by DIMIA of how ACM was actually running the centres. Richard Harding: It shows that without proper supervision or care from DIMIA, ACM did indeed develop its very own culture of indifference and worse than indifference, in fact virtually all of the riots that we've seen film and video of over the years, shows not riot control so much as riot provocation behaviour by the on-site operators, ACM. But you always come back to the fact that this is being allowed to happen by the persons with the responsibility in international law, in duty of care terms, in political terms, for running a decent operation. DIMIA and ultimately the Minister and the Federal government. Tom Morton: The HREOC Report also reveals that senior bureaucrats in the Immigration Department in Canberra ignored the warnings of their own on-the-ground staff that things in the detention centres were going wrong. Now many of the issues raised in the HREOC report have been raised repeatedly in relation to privately-run immigration detention centres in the US and Europe too. But Richard Harding says it's not the presence of private companies which is the fundamental problem. Some companies, for example, do a good job of running private prisons. Richard Harding: It is, I think, demonstrably clear from international experience that if they are properly accountable, they can in fact deliver appropriate and often very good services, and the problems always come when the accountability mechanisms are slack or ignored. They can go wrong in the private prison setting but there are more robust controls, whether coming from offices such as my own, or from much more active monitoring and audit and performance teams in the correctional departments looking to see what the private operators are doing. The particular matter of detention centres is that the government wanted this to be out of sight and out of mind. Tom Morton: Richard Harding, the Inspector of Custodial Services in Western Australia. John McCain: Mr Secretary, I'd like to know, I'd like you to give the Committee the chain of command from the guards to you. I'd like to know who was in charge, what agencies or private contractors were in charge of interrogations; did they have authority over the guards; and what were their instructions to the guards? Tom Morton: US Senator, John McCain, quizzing Secretary of Defence, Donald Rumsfeld. There's an eerie similarity between the questions being raised about accountability and scrutiny in Australia's detention centres, and similar questions now being asked about human rights abuses in the Abu Ghraib prison in Iraq. Recently, attention has focussed more and more on the private contractors who have been implicated in at least some of the abuses in Abu Ghraib. The contractors were interrogators and interpreters employed by two companies, CACI International and Titan Corporation. A fortnight ago on the ABC's Four Corners program, former CIA official Bob Baer had this to say about the two companies. Bob Baer: Using contract interrogators is utter stupidity, because you've completely lost control of the process. You were taking national security and handing it to a private company whose objective is to make money, not national security. So I mean a company like these Beltway Bandits is going to be more interested in covering up and producing what the government wants in order to have contracts renewed. There's no accountability inside private contracting companies. Tom Morton: Bob Baer. According to a recent report in The Financial Times, high-ranking legal officers in the US military have claimed that the Pentagon deliberately employed contract interrogators to avoid scrutiny by Congress. The lines between civilian and military personnel in the Abu Ghraib prison appear to have been blurred. Video footage of one incident of sexual humiliation of prisoners shows a civilian contractor wearing an army uniform, but without any insignia of rank or identification. None of the civilian contractors involved in the abuses in Iraq have so far been charged. But just this week a contract interrogator employed by the CIA in Afghanistan has been charged over the death of a detainee who was severely beaten over two days. He's the first private contractor to face criminal charges. Two of the army personnel who have been charged in relation to the Abu Ghraib abuses are prison officers in civilian life. Judith Greene says that the abuses committed at the Abu Ghraib prison are strongly reminiscent of the culture of prisons in the United States, both public and private. And although there are no direct links between the private prison industry and the abuses in the Abu Ghraib prison, Judith Greene believes there is a common thread in the use of private contractors by government to evade responsibility. Judith Greene: One of the incentives for privatisation of government services has been the issue of liability. Private prison companies have always sold themselves to state and federal officials as 'We'll take over the problems that you have; we're going to be fully insured, we'll carry the liability; if lawsuits come, we'll provide the lawyers, etc.' In reality, of course, that doesn't leave government off the hook when there are problems, but it makes the whole thing cloudy, it dilutes responsibility. In cases here where mismanagement or violent behaviour or deaths in our private prisons have resulted in lawsuits, then what you get is a great deal of finger-pointing, 'He's responsible,' 'No, you're responsible,' 'You were doing the operation,' 'Well you know, the government's responsibility is to monitor,' etc, etc. So who is ultimately responsible becomes a matter of litigation. Tom Morton: Richard Harding sees a similar link between Abu Ghraib and issues raised in relation to Australia's immigration detention centres. Richard Harding: Let me say again what Dr Ozdowski and HREOC say so very clearly: international standards and obligations are not something you can contract out of. It of course is true to say that the people themselves, the actual individuals and the companies they work for at Abu Ghraib, were in breach of standards also, but that is not to exonerate or somehow or other hide from responsibility the US government, which has set up a situation where breaches of international standards occur in their name. So it's a very close parallel, it's even worse of course because it's even more secretive, until very recently when the media broke it open. The people involved were even less well qualified or trained to be involved than say ACM staff in the situation in our own immigration detention centres. So it's about as bad an example as you can get. Tom Morton: Richard Harding. And those same issues of moral and legal liability, which he and Judith Greene have been raising, may come back to haunt the Australian Federal government and the former operator of the detention centres, ACM. Already, ACM is facing compensation claims from former detainees and former employees, Charandev Singh from the Brimbank Community Legal Centre in Melbourne. Charandev Singh: Yes, I'm aware of 14 actions for compensation from detainees that have either been settled out of court, or remain ongoing. And almost two-thirds of those are in relation to assaults and batteries experienced by detainees at the hands of ACM officers, and the vast majority of those have been settled out of court. There have been numerous claims filed by staff against ACM for unsafe work practices, for injuries like post-traumatic stress disorder suffered by staff in detention centres, and the vast majority of those have already been paid out in large amounts. Tom Morton: The Human Rights Commission didn't make any specific recommendations in its report about compensation. Commissioner Ozdowski says that his brief was to examine the systemic nature of conditions in the detention centres, rather than individual cases. But he says his systemic findings may well be used in support of future compensation claims. Sev Ozdowski: These systemic findings certainly will be used in any future compensation cases. I can assure you that that report will be used by the people representing people who entered detention and were claiming compensation, but it's up to individual judgment in individual cases. Tom Morton: And do you believe that your systemic findings could be used in support of claims both against the Department of Immigration and against the service provider, ACM? Sev Ozdowski: The systemic findings which we delivered are clearly showing that the rights of children were not protected and that as a result a number of them lost mental health. And these systemic findings will, I believe, support individual cases for compensation both against the government and ACM. Tom Morton: You've been listening to Background Briefing. Our Co-ordinating Producer is Linda McGinnis; Technical Operator was Mark Don; Research was by Paul Bolger; our Executive Producer is Kirsten Garrett and readings were by Justin Monjay. I'm Tom Morton, stay with us now on ABC Radio National. UK Prison Ombudsman's Report "INVESTIGATION INTO ALLEGATIONS OF RACISM, ABUSE AND VIOLENCE AT YARL'S WOOD REMOVAL CENTRE"